Give someone the gift of health - with the luxury of choice! 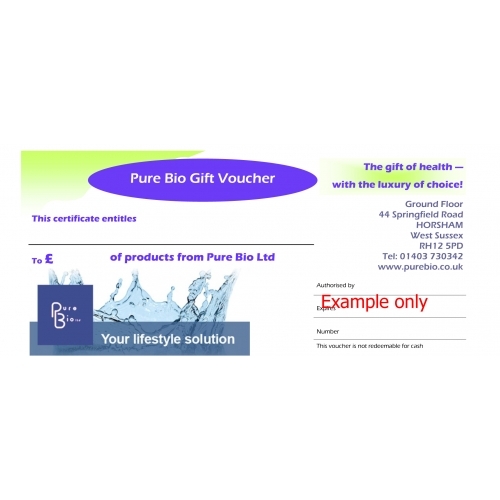 A Pure Bio Gift Voucher is the perfect present if you are not sure what to buy. Choose one of our elegant Gift Vouchers available in £5, £10 and £20 values and delivered in an attractive envelope – the perfect gift of choice. The gift voucher may be redeemed for any of the products supplied by Pure Bio, including Supplements, Organic Toiletries & Cosmetics, Books, Organic Socks - and so much more! Please note: all Pure Bio Gift Vouchers are valid for one year from the purchase date.